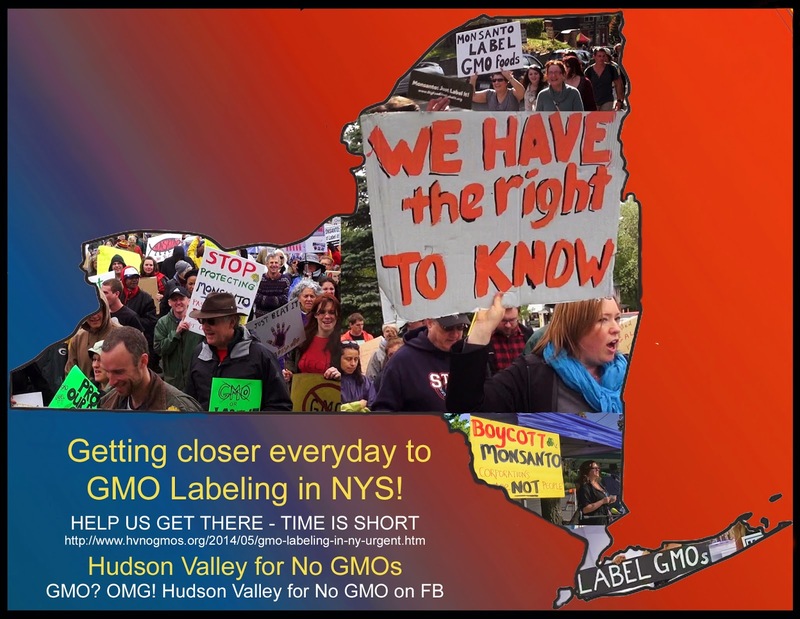 Hudson Valley for No GMOs: GMO Labeling in NY - URGENT! 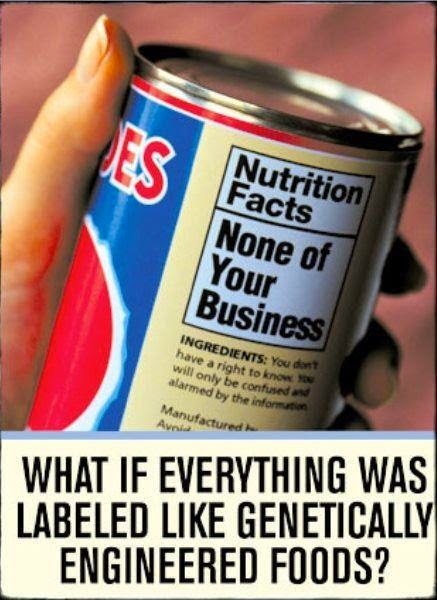 GMO Labeling in NY - URGENT! GMOs (genetically modified organisms) are labeled, restricted or banned for over three billion people in the world! Our country is far behind. Many in this country just assume GMOs are safe because they think the FDA has done extensive testing to assure their safety. They have not. The FDA depends on companies like Monsanto to tell us GMOs are safe. Twenty years ago, there was an overwhelming consensus by FDA scientists that GMOs could create nutritional deficiencies, new hard to detect allergens, toxins and new diseases, but political appointee and former attorney for Monsanto, Michael Taylor, overruled their concerns and wrote the policy saying GM food was substantially equivalent to normal food. Taylor was awarded for this by being named the VP of Monsanto and is now back as the FDA Food Safety Czar! The system is rigged to benefit corporations even at the expense of public safety. How many Americans are aware of the corruption of the FDA? How many stories about GMOs do you see on mainstream media (MSM)? Even the NY Times repeats Monsanto's talking points rather than expose the hundreds of studies that show that GMOs are dangerous to our health and the future of the planet. 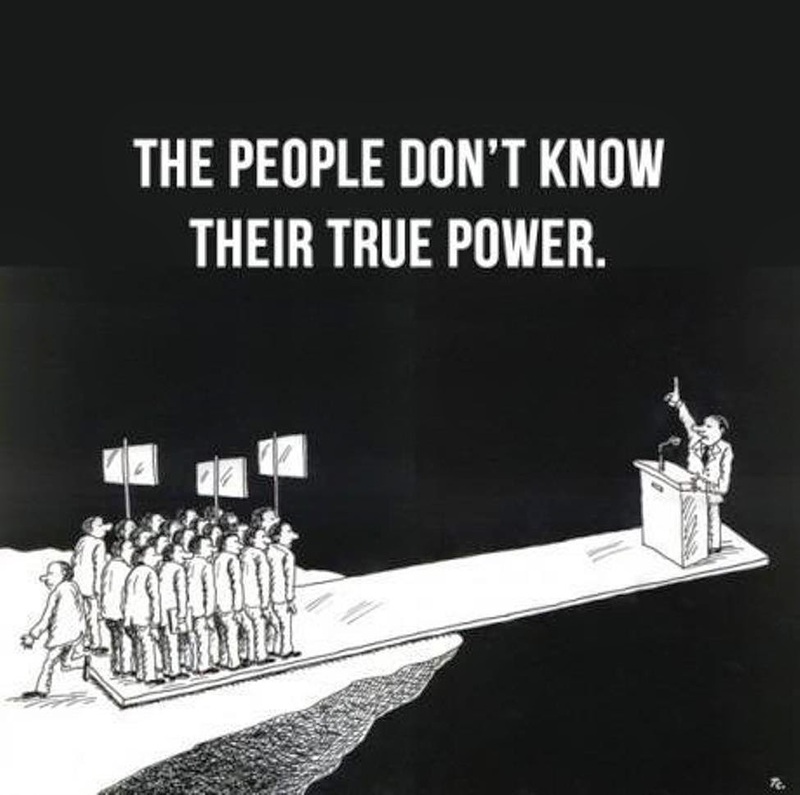 The collusion of government and corporations, which includes MSM, is a mighty force, but our desire to protect our loved ones and our earth is stronger. Other countries, like those in the European Union have done it and we can too. Connecticut and Maine have passed GMO labeling bills that will go into effect when surrounding states pass similar legislation which is inevitable. Vermont just passed and the governor has signed into law the first GM labeling bill with no strings attached. And now it is our turn. Last year in New York, we lost the opening volley by only two votes. 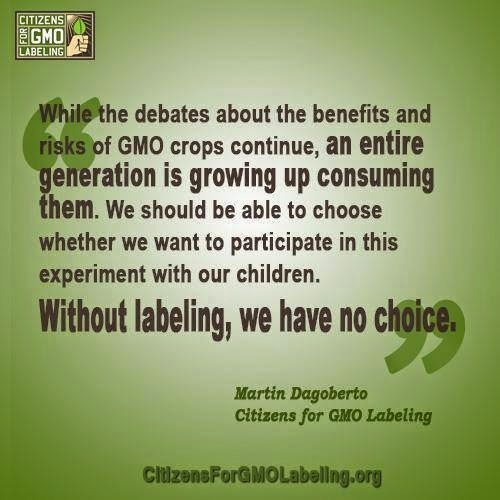 This year, we have already passed one hurdle (the bill requiring GM labeling passed in one committee!) and now we have to keep the momentum going. Please get involved. New York State legislators tell us hundreds of phone calls, and e-mails DO make a difference! URGENT ACTION ALERT for NEW YORKERS! CONTACT ASSEMBLY CODES COMMITTEE! PLEASE READ CAREFULLY! Bill A.3525, successfully voted out of the Assembly Consumer Affairs and Protection Committee by a margin of 9-6, has now been referred to the Assembly Codes Committee, where it will need to be “put on the agenda” in order to be voted on. It’s the chair of a committee that decides whether or not to put a bill on his/her committee’s agenda, so it’s very important that committee members who are supportive of GMO labeling put pressure on the chair to do so. There are 22 members of the Assembly Codes Committee, including the chair; in order for a bill to pass out of this committee there must be a minimum of 12 YES votes. The good news for us is that 12 of these committee members are already cosponsors of the bill, and one of them is the chair, Joseph Lentol. But this doesn’t mean we’re looking at a sure-thing slam dunk. Believe it or not, just because someone has added their name as cosponsor to a bill doesn’t automatically mean they’ll vote YES on it when it comes up for a vote. Why, you ask? Because this is politics, folks! Welcome to our democracy! We are up against some of the biggest companies in the world and they are not exactly rolling over and playing dead. We have our work cut out for us, and then some, especially because we were victorious last week. But WE WERE VICTORIOUS! Below is the contact list for these 22 Assemblymembers. We are asking that ONLY THEIR CONSTITUENTS CONTACT THEM. We have it on good authority that getting hundreds of calls and emails from voters outside their district falls on deaf ears and sometimes aggravates office staff. We don’t want to aggravate. A phone call is better than an email, but I’ve provided contact info for both. 1. Identify yourself as a constituent – very important! 2. Thank them for being a cosponsor on bill A.3525 and supporting your right to know if your food has been genetically modified. PLEASE SHARE THIS ACTION ALERT WITH ALL NEW YORKERS YOU KNOW WHO EAT FOOD!